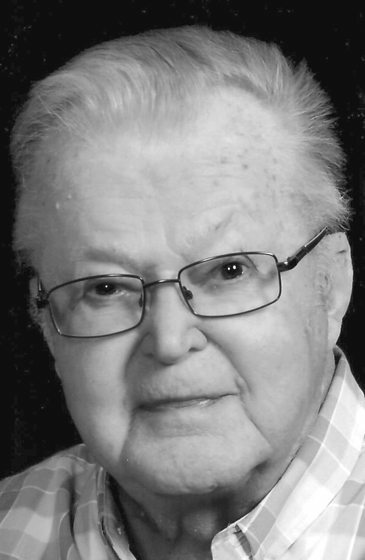 REPUBLIC, MI – James C. “Chebu” Mackey, age 88, longtime Republic resident, passed away on Friday, January 12, 2018 at the Marquette Co. Medical Care Facility in Ishpeming where he had been a resident since October 2017. James was born June 17, 1929 in Chicago, IL the son of the late John A. and Saima (Sirtola) Maki. Mr. Mackey graduated from the Republic High School, Class of 1947. He served his country in the United States Army during the Korean War with the 45th Infantry Division. James returned to this area and married the late Mae Elaine Suomi on Sept 25, 1953 in Republic. James had worked for Inland Steel at the Greenwood Mine for 3 years prior to working for the Cleveland Cliffs Iron Co. as a Heavy Equipment Mechanic at various mines including the Humboldt, Republic and Tilden retiring in August of 1991. James was a member of the Bethany Lutheran Church in Republic, a life member of the Republic VFW. He enjoyed doing carpentry work along with tinkering with cars. During his retirement years he loved spending his winters in Florida, enjoying his time with Debbie, Gary, and Todd. Survivors include a daughter Debbie (Gary) Schultz of Tavares, FL, grandson Todd Schultz of Tavares, FL, fiancee Marie Olien and her family members Robert (Debbie) Bengston, Debbie (Ralph) Gardner, Rod (Linda) Bengston and Robin (Jon) Jarvi, special nephew Ray (Brenda) Mattson all of Republic, along with several other nieces and nephews. He was preceded in death by his wife Mae Elaine Mackey on Jan. 9, 2002, an infant son Robert James Mackey and brother Wallace Mackey. Funeral services will be held at 2:00pm on Thursday, January 18, 2018 at the Bethany Lutheran Church in Republic with the Rev. Kevin Kaiser to officiate. The family will greet relatives and friends from 1:00 – 2:00pm on Thursday at the Bethany Lutheran Church in Republic. Interment will take place in the spring at the Republic Cemetery where Military Honors will be accorded. Members of the Republic VFW will serve as honorary pallbearers. Memorials may be directed to the Republic Veterans Memorial, 279 Kloman Ave., Republic, MI 49879 in James’ memory. James’ obituary may be viewed at bjorkand zhulkie.com where relatives and friends may leave a note of remembrance.